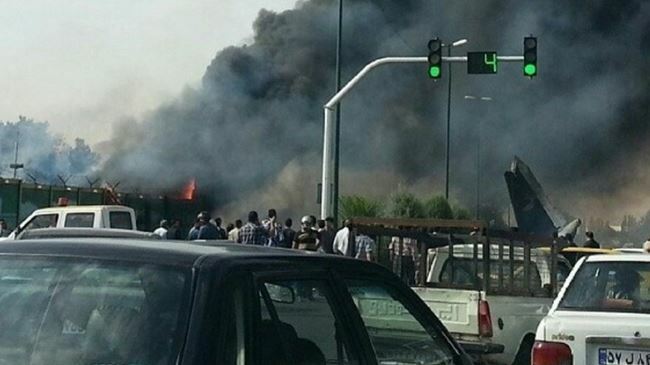 JNN 11 Aug 2014 Tehran : An Iranian plane with over 40 people on board has fatally crashed near the capital, Tehran. The incident took place on Sunday morning north of the International Mehrabad Airport, IRNA reported. The Antonov An-140 aircraft belonged to a domestic airlines and was scheduled to travel from Tehran to the northeastern city of Tabas when the incident occurred. A senior aviation official has said 48 people, among them several children, were on board the plane when it smashed into the ground. All passengers and crew members are feared dead. Initial reports blame an engine failure for the disaster. Iran has suffered a series of airplane crashes, blamed on its aging aircraft and poor maintenance. The latest major crash occurred in January 2011, when a passenger plane broke into pieces on impact while trying an emergency landing in a snowstorm in northwestern Iran, killing 77 people. In July 2009, a jetliner crashed in Iran’s northwest shortly after taking off from the capital, killing all the 168 people on board. In the worst air accident, an Ilyushin 76 crashed in the mountains of southeastern Iran in February 2003, killing 302 people on board. This entry was posted in Iran News and tagged International Mehrabad Airport, iran, Iran Airline, Iranian Airline Crash, Tehran. Bookmark the permalink.